I shouldn't be disclosing the recipe for this salad. It's too easy, and everybody who brings it to a pot luck is instantly deemed a genius. It's not necessarily an elegant salad, or a fancy ingredients salad, but that's the beauty of it. My mother had tasted it at a local annual family reunion of a close family friend, prepared by either a grandma or a caretaker of the local retired priests or Mary Magdalene or somebody equally as holy. She inquired as to the recipe, and then brought the dish to Nantucket this year for our own little family reunion and as it so also happens, my annual birthday bash. When she said she was going to be bringing a bok choy salad, I tried to hide my inner WTF. But when it comes to food, my mother has excellent taste, and if she thought the salad was the end all be all of bok choy salads to bring to a party, I trust her to the ends of the earth. So the preparation, like I said, is simple. Here's your entire recipe. Combine all ingredients and whisk together. Let sit in the refrigerator overnight so that the mighty amount of sugar has a chance to fully dissolve. Now, I tend to substitute out different nuts or seeds that I have on hand, because basically anything works really well in this salad. So in this case, I melted the butter in a large frying pan, and waited for it to smoke. I crushed up the ramen noodles, and because (again) I had them on hand, I added 3/4 cup of pine nuts and a 1/2 cup of crushed walnuts. Fry up all the crunchy bits in the butter, and when nice and brown, remove and add to a plate with a paper towel to drain a little bit. FOR THE VEGETABLE PIECE OF THE RECIPE:Take about a head and a half of bok choy, and roughly chop. You can substitute out basically any greens. If you like spinach or romaine, use either one. However, I really love the bitter leaves on raw bok choy, and they work particularly well with the sweet salad dressing. 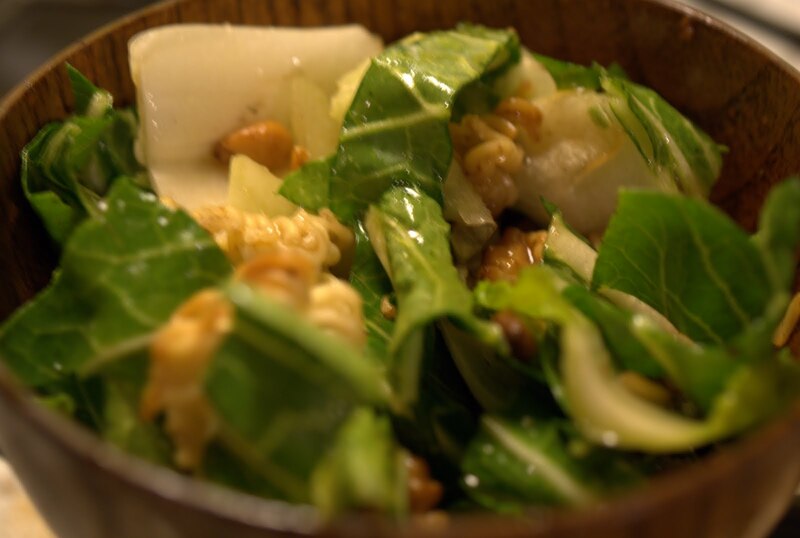 Roughly chop whatever greens you decide on, and toss with the crunchy bits and the dressing immediately prior to serving. The salad is crunchy. It has the previously mentioned play between bitter greens and a sweet, salty salad dressing. Those ramen noodles, college ramen noodles, never had a better use. It's really just a fun, easy salad that is welcome at any party, despite even the most picky of eaters. Please give it a try.